Ramadan is the month of fasting for Muslims all around the world. It is a month which preaches the idea of self-control, calmness and compassion and the end of this month of fasting is marked with the celebration of Eid. This entire month, especially Eid, holds a significant value amongst all the Muslims and is celebrated with a great zeal and sheer enthusiasm. Almost all the family members take part in the fasting except for the small children and in such a scenario, it becomes difficult to handle the hyperactive and over enthusiastic children. For such times, we have the perfect solution for you- Engage your child in some Eid special crafts that will not only keep him busy but will also educate him about the holy festival. Moreover, we have some easy Eid themed craft ideas for you that can be used to decorate your house during this festival without any much hassle. How about making a DIY moon piñata, a simple tissue pom-pom or shiny stars to adorn your walls this Eid? Take a cutout of the moon on a cardboard and cut a tissue into three parts. Fold each part into three folds and make small incisions on one end to create a fringy effect. Cover the entire moon cutout with these tissue fringes made using glue and your moon piñata is ready in no time. Similarly, for the tissue pom-pom, make a tissue stack of eight tissues by keeping them one over the other and fold the stack inwards and outwards alternatively just like we do while making a paper fan. Tie the center of this fan with a yarn or a thread and trim the edges of the stack. Finally, separate each tissue using your hand and just when all of the tissues unfold, your tissue pom-pom will be ready. For the shiny stars, take a cut out of a star on a cardboard and wrap it using aluminium foil and you will get beautiful shiny stars to decorate your house. When you have an entire month to fast, it’s best to make a countdown calendar to keep a track of the passing days and tell yourself that Eid is coming. If you are a creative person with a wish of doing something different and unique and making this festival a memorable one, we have the most apt video for you here. The most easy and simple activity for kids that will not only help them to develop knowledge about Ramadan but will also help in improving their creativity and gross and fine motor skills as well. All you have to do is get a print put of the outline of a moon and stars on different sheets. Cut out kite papers of different colors in random small pieces and put them all together in a bowl. No, ask your child to fill up the outline of the moon and stars and complete the shape by sticking the paper pieces inside the boundary of the shape. You can show the child how to do it once and then let him do the rest. Once he is done with the pasting, cut out the moon and stars and ties them together using a string or a thread. While doing the activity, you can tell your kid importance of the festival and other things related to it. What could be better than creating a mosque at your own home and getting the blessings of the mighty Allah that too in just two simple steps? 1. 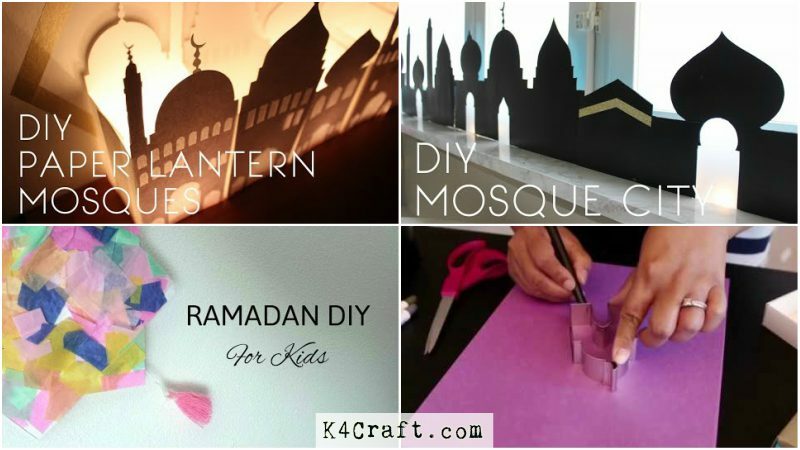 Cut out two templates of a mosque that are readily available on the net and use a craft knife or a cutter to cut out the windows. 2. Fold the edges of both the cut outs using a ruler and stick them together from both the ends forming a two sided closed mosque. Ever thought that the masjid cookie cutters used for giving shapes to the delicious cookies can also be used for making beautiful banners for Eid celebration? All you need is the cookie cutter moulds, some colored sheets and glue. Trace the shape of the moulds on to the colored sheets and cut them out. Use glue to make the outlines and design on the cut outs and tie them together using a thread or a string. Your banner is ready! Your inner pop-up is ready. Glue it on another sheet that will make the front of your card and decorate it as per your requirements. The best of all gifts around any Eid is the presence of a happy family all wrapped up in each other and crafting together helps you to achieve the same. This Eid, try some of these craft ideas and decorate your houses like never done before. Keep crafting, keep celebrating and stay tuned to our website for more of such amazing and easy to make DIY crafts ideas for different occasions.